Being found on Facebook search - Brand loyal customers will directly be searching for the business name. Users will easily find you given that the estate agent has fully filled out their page and the estate agent's name is not a generic term. E.G 'Country Estates'. Build yourself a Fan base - Estate agents ideally want the snowball effect to occur on their fan page. 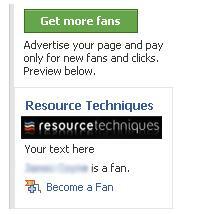 The more fans you have, the more Facebook will automatically suggest your page to other people in their network. Keep active - One major hurdle is keeping active within the community. Again if Facebook users see that estate agents are active on Facebook, they'll be encouraged to keep coming back. Keeping them coming back increases the chance that users will interact. Users that interact will show that they have been active on the wall of their personal profile page whilst also increasing the chance the Facebook will choose to show it in their friend's newsfeed. Let your buyers and vendors know in the real world - Many estate agents forget that their online world connects to the physical world. Simply asking buyers, 'Are you on Facebook?' Could be the turning point in many cases. Advertise - Facebook has a feature that lets estate agents advertise their fan page to friends of people who have become a fan of their page. This is a great way for estate agents to increase traffic and fans. Below is an example of the advertisement from Resource Techniques. The text 'web design for estate agents' is completely editable and Facebook provides guidelines on the best practices.